Olympic Sponsors Go For The Golden Image Corporations spend millions to attach themselves to the Olympics, getting exclusive rights that they hope will boost the corporate image in return. But they also provide behind-the-scenes perks, like doing athletes' laundry, providing free food and handing out diapers for their children. 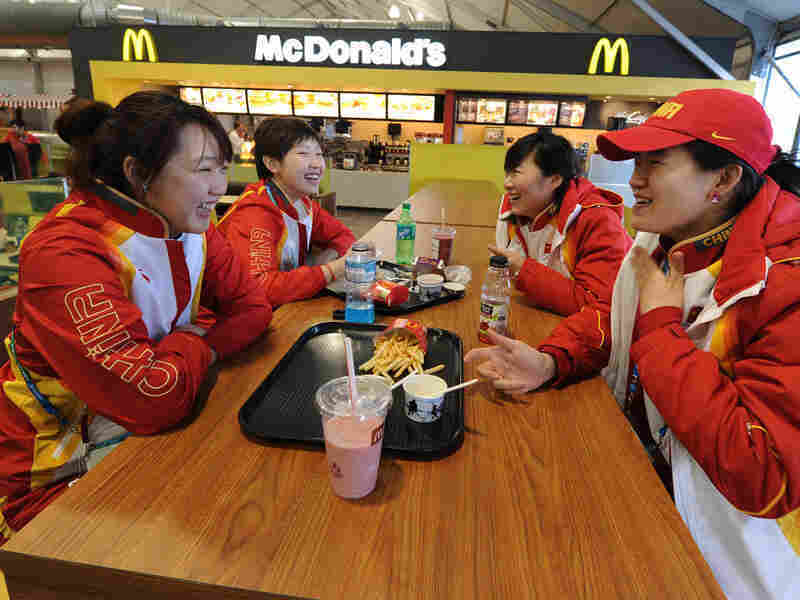 Chinese short-track speedskaters eat in the dining hall during a media tour of the Olympic Village in downtown Vancouver on Feb. 9. At the Vancouver Olympics, competition venues have been scrubbed of almost anything that hints of commercialism. The ice hockey arena known as General Motors Place is called Canada Hockey Place during the Olympics. And no venue has billboards, signs or logos touting products or companies. But outside the venues, Olympic sponsors have an unavoidable presence, from the blizzard of commercials on television to the busloads of corporate visitors to the sides of city buses to the billboards sporting the five Olympic rings. The privilege of displaying the rings comes at a steep price. The biggest Olympic sponsors, known as TOP (for "The Olympic Partner" program) sponsors, pay as much as $20 million a year each for exclusive use of the Olympic rings in advertising and logos. They also get exclusive status as the official restaurant (McDonald's), credit card (Visa), soft drink (Coca-Cola), watch and timing systems (Omega) and computer (Acer) of the Olympics. There are nine TOP sponsors now. None will reveal the actual costs of their Olympic arrangements. Lesser sponsorships involve specific athletes, sports federations and national Olympic committees. And they all saturate the Olympics with ads, products and services. "Snacktender" Gretchen Cruz serves up chips at the Pringles Zone in the four-story P&G Family Home, set up for American athletes and their families and friends during the Vancouver Olympics. Some companies link with athletes in ways that are little known to the public. Procter & Gamble, the home products giant, has the "P&G Family Home," a four-story refuge for American athletes and their families and friends in an office building in downtown Vancouver. The hangout for the athlete entourage features themed rooms named for P&G products. The Tide Laundry Center does laundry for free. 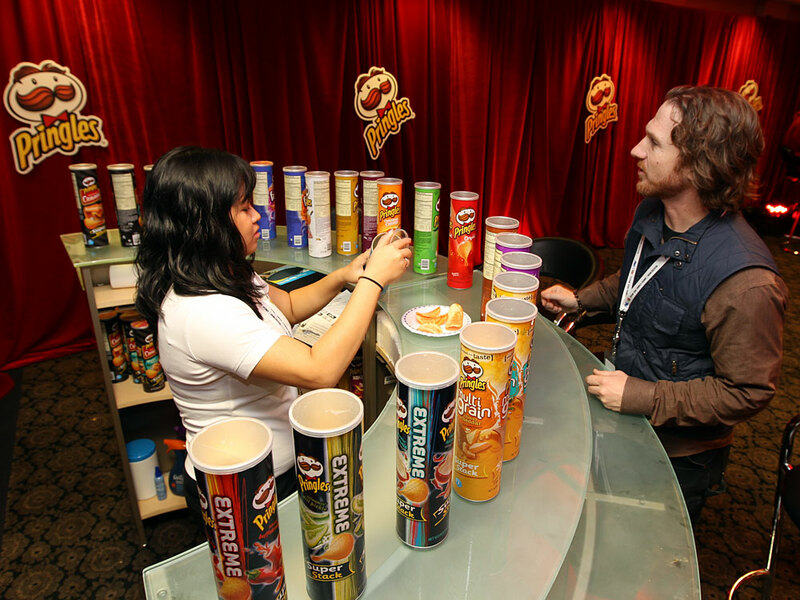 The Pringles Zone has a bar serving nothing but Pringles chips in 29 flavors. The Pampers Village has diapers with the five Olympic rings imprinted on them and a play center for kids. There's even a salon for hairdos, makeovers and massages. And there's always plenty to eat at a snack buffet next to the Internet cafe or the full-service dining room downstairs. "The Olympics really touches on our purpose of touching lives, improving life, but then also there's a very strong business build," says P&G spokesman Dave McCracken. "[The Olympics] is the number one sport among women and the number two among men. It is the type of event that brings families together to watch the Olympics." And when families watch Olympic broadcasts together, they see emotional P&G ads. One features a series of moms, singing to their kids as they rock them as infants, button their coats, take them to hockey practice and cheer for them on the figure-skating ice at the Olympics. The ad borrows the Jerry Lewis telethon theme song, "You'll Never Walk Alone." "P&G," the ad says at the end, "Proud sponsor of moms." There's a sober reality to this emotional branding, says Robert Barney of the International Center for Olympic Studies at the University of Western Ontario. "What [corporate sponsors] are really in for is to expand their brand," Barney says, and "to protect their market share ... and to get in ahead of their main competitors because the Olympic movement gives them exclusivity." Procter & Gamble has had individual products with Olympic ties in the past, but a complete corporate sponsorship is relatively new. Company officials are confident the undisclosed investment will pay off. And some sponsors must be getting something out of the Olympics, because they've been at it a long time. Coca-Cola has had Olympic ties since 1928. McDonald's has been involved with the Olympics for 40 years and has been the official restaurant of the games for eight Olympics. But even that kind of longevity doesn't guarantee some sort of payoff. "There's a risk if it's perceived by the public to be anything less than authentic," says Patrick Quinn, a former speedskater and luge athlete now with Chicago Sports & Entertainment Partners, a sports marketing firm. Quinn is talking specifically about athletes and sponsors, but the same risk applies to corporations and the Olympics. And the best example of that may be the tangling of the five Olympic rings with the Golden Arches. Gymnastics gold medalist Shawn Johnson (left) with her smoothie-making team of Jalena Keane-Lee, 14, from California, and Louisa Peters, 12, from Germany, at the event in which McDonald's rolled out a new line of smoothies. McDonald's has a ubiquitous presence at the Olympics. It builds restaurants inside the athlete villages and the media center for reporters. Athletes, coaches, officials and journalists can get Big Macs, Egg McMuffins and Chicken McNuggets 24 hours a day during the games. Outside the official venues, McDonald's restaurants feature Olympic promotions and themes. And McDonald's commercials blanket the airwaves. One ad running in Canada features a McDonald's employee meeting speedskater Cindy Klassen — Canada's most decorated Olympian — in an airport. "Look. Egg McMuffins, my favorite," the cheery young woman says to Klassen, as she rustles a McDonald's bag. "Me too," Klassen replies. "Guess where I'm going?" the woman then asks. "The Olympics. Yeah, with McDonald's. I'll be working in the athletes village. ... It's going to be amazing." "And you're doing that speed skating thing, right?" the McDonald's employee asks. "Yeah," Klassen says, setting up the young woman's punch line. "Well, that'll be fun, too." Mary Dillon, the chief marketing officer of McDonald's, is matter-of-fact about what the fast-food giant is after with its Olympic sponsorship. "What we expect to get is more people coming to our restaurants, more people watching the Olympics and associating the great spirit of the Olympics with our brand," Dillon says. "When you're a global brand like McDonald's, that's a good thing, to continue to build connections that are important to people. It's as simple as that." McDonald's used its Olympic sponsorship in 2008 in Beijing to help expand its markets in China, where Kentucky Fried Chicken has far deeper penetration. But the Olympic link with McDonald's is neither natural nor benign to critics of the company's high-fat, high-salt and high-calorie fast food. McDonald's Olympic sponsorship is "just part of a broader marketing effort that I think is designed to try to use the healthiest, most active and most fit among us to try to convince us that the fast-food industry's products are perhaps more beneficial than I think they are," says Gary Bennett, an associate professor in Duke University's Department of Psychology and Neuroscience. Bennett studies obesity in high-risk populations and notes that Olympic athletes might quickly burn off the thousand calories in a Big Mac, medium Coke and medium fries, but not most of the rest of us. Bennett is especially distressed by the tagline in a McDonald's TV commercial for a new Chicken McNuggets sauce. The ad shows a bobsled at a McDonald's drive-through and an athlete dipping McNuggets in the new sauce. "So now," the announcer promises, "you don't have to be an Olympic athlete to eat like one." "I'm concerned about the potential, particularly for children, to believe that they too can be an Olympian by having a Happy Meal," Bennett says. Of course, McDonald's is aware of this kind of criticism. But the fast-food giant is also using the Olympics to stress what it considers to be healthier options on its menu. 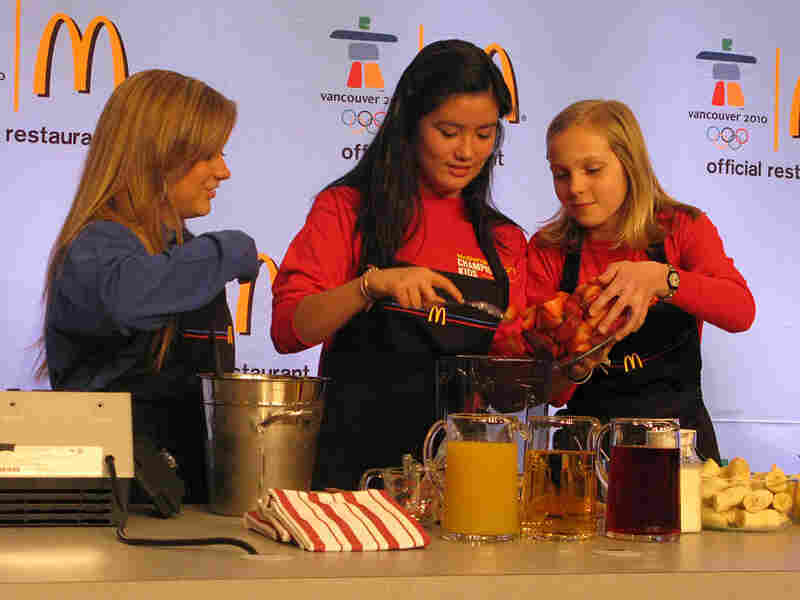 The week before the Olympics, company officials turned the McDonald's at the Main Press Center in Vancouver into a stage for its new fruit smoothies. Ronald McDonald served as master of ceremonies as gymnastics gold medalist Shawn Johnson, Alpine skiing gold medalist Picabo Street and figure-skating gold medalist Katarina Witt teamed up with kids who had won a McDonald's contest that brought them to the Olympics. "All right, ready, set, go!" the McDonald's clown yelled, as the athletes and their partners stuffed fresh fruit into blenders, devising their own smoothie recipes on the spot. TV crews moved in for close-ups of the churning smoothies in the blenders and dignitaries from the International Olympic Committee and the U.S. Olympic Committee praised the McDonald's partnership. Dillon, the McDonald's marketing chief, summed up the message this way: "Olympic athletes are an excellent example," she said, "of how people can enjoy their favorite McDonald's foods as part of an active, balanced lifestyle." But not all athletes are ready to munch McMuffins in the morning to prove McDonald's point. At a pre-Olympic news conference, snowboarder Hannah Teter answered a question about training and preparation with this snarky answer. "They have McDonald's at the athlete village," Teter noted. "So I'll hit that up every morning." Then she added, laughing, "Not!" Still, some athletes couldn't be happier to have McDonald's in the village and in the Olympics. In fact, in McDonald's-Olympic lore is a story about the 1968 games in Grenoble, France. American athletes, the legend says, were so desperate for food from home that McDonald's burgers and fries were airlifted in. Veteran speedskater Jennifer Rodriguez can believe it, given what she's seen at the athlete's village in four Olympics. "The first thing you eat after your event, you go and get that hamburger, or cheeseburger," Rodriguez says, laughing. "That's how you can tell who's done [with competition]. Everybody treats themselves to McDonald's, and I think every athlete pretty much appreciates McDonald's being there." American athletes are especially tolerant of corporate sponsorships. The United States is the only major competing nation without government funding for Olympic athletes and sports. Corporate sponsorships provide the bulk of the money for training, travel and stipends. Outside the P&G Family Home, as athletes and their family and friends wait in line to get in, speedskater Chad Hedrick is unflinching about his assessment of corporate sponsors. "Without corporate sponsors like this, these athletes struggle," Hedrick said. "And in return, it would be very hard to compete against the other nations in the world. So all these corporate sponsors are key for us to go out and perform the way that we do. And we're very grateful."